We are committed to: Bold and risky faith, creating world change through a ministry of love, prayer, evangelism, compassion and mercy rooted in Jesus. There is not a church of God with a mission in the world, but rather a God of mission with a church in the world. The Ranch Church, through generous donations from parishioners, provide much needed support to the La Gloria Orphanage. The La Gloria Orphanage provides much needed support to children in Tijuana, Mexico. This support includes food, a place to live, spiritual guidance, educational support and so much more. In addition to the generous donations provided by the congregation, several times a year, mission trips to Mexico are taken that include visits to La Gloria where the orphans have a chance to be blessed by the volunteers. However, this blessing is returned in kind as the volunteers are blessed by the love these children have for the visitors as well as for each other. In 2011, God placed us primarily in Vista del Valle, Tijuana, Mexico to pastor a new Calvary Chapel (Christian) church where Pastor Jose Luis teaches the Word of God verse by verse which is not common in our area. We have a thriving youth ministry, wonderful worship band and Cindy serves in Children's Ministry, Women's Ministry and Mercy Ministries. The Mercy Ministries we have are the Tijuana School Program, 3 Lunch Kitchens for 175 kids per day, some medical needs and small construction projects. We report directly to Horizon Ministries in Ensenada and are a church plant from Calvary Chapel Rosarito. 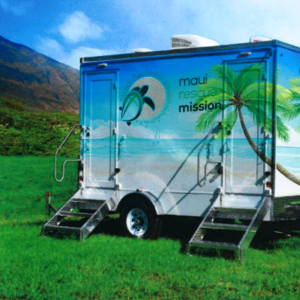 Maui Rescue Mission is here to provide a safe place for the homeless of Maui to take a shower, check their emails, get free counseling, and much more. We Believe that you must listen to people to be able to help. We also believe that Jesus Christ is the power that so many of these people need. He alone can give them hope in a situation that seems hopeless. Most of Maui’s homeless have fallen through the cracks. They need some direction or encouragement so they don’t completely give up. We realize that there are many issues that the homeless face. Substance abuse, mental illness, health issues, and broken relationships just to name a few. We are partnering with Biblical Counseling Center of Maui to be able to help the individuals who show interest in rebuilding their lives. All children can expect to live into adulthood to serve God and their neighbors. Families have the tools they need to build and sustain a better life and become self-sufficient. Equipped with the right knowledge and resources, we truly believe Haiti can transform from an impoverished nation to one of self-sufficiency that is full of life. It is our goal to continue providing Lougou, and other southern Haitian villages, with the empowerment, tools and education they need to be successful. We firmly believe this is the only way to achieve long-lasting transformation from poverty to self-sufficiency. The Ranch Church provides monthly financial support to COFHED. In addition, members of the congregation support Haiti by making mission trips to continue to assess needs of the community. We believe we can help grow God’s Kingdom in El Salvador through missionary care. Our calling is to help keep missionaries healthy so that they can complete their callings, and we desire that none who have been called by God to serve El Salvador would leave before their mission has been accomplished. Many missionaries are hungry for community, for conversation in English, and for the chance to connect with others who understand them. Out of this need, the El Salvador Missionary Fellowship was born. There is a now a network of missionary families across El Salvador who are able to find the community and caring that they need to thrive in life and ministry. The Ranch Relief Ministry is a ministry created in 2017 to provide support to communities that are affected by natural disasters. All donations made to the Ranch Relief Ministry go directly to relief efforts. The Ranch Relief Ministry exists as a safe, and secure vehicle to bring practical help to those who need it most. All donations are fully tax deductible and will be distributed according to the specific project or current need. Every cent given will be distributed to needs in the field instead of covering admin or other organizational expenses. The Ranch Relief fund is financially run through the Ranch Church and it's Pastoral Leadership Board. In 2017, the Ranch Relief Ministry provided relief to those in Puerto Rico that were affected by Hurricane Maria. Relief efforts continued into 2018 with over $60,000 raised to benefit those in need. Working closely with Calvary Chapel Puerto Rico, donations were used to provide food, clothing, generators and medical supplies.